I knew fall was right around the corner when the box of farm fresh vegetables we get biweekly from our local farm was loaded with dark red, juicy heirloom tomatoes a couple of weeks ago. 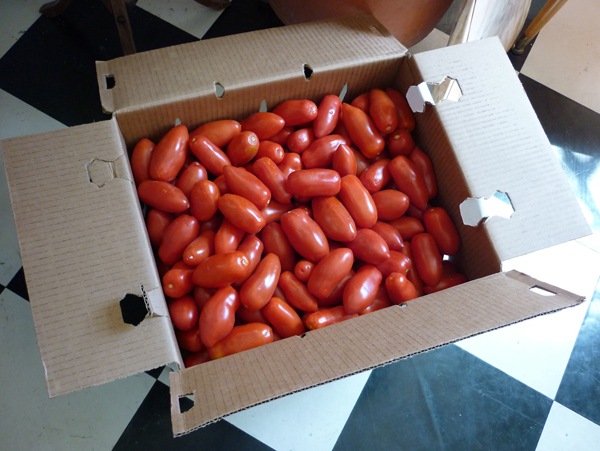 In fact, Mariquita Farm had so many tomatoes that they were selling them by the boxes. 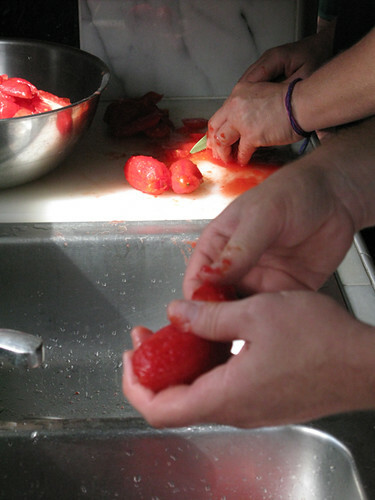 My partner Deb and I got so many tomatoes that we called our friends Ray and Alan and had a tomato canning party, spending a fun afternoon cutting, peeling, slicing and boiling our luscious little friends. Canning fresh fruits and vegetables as a cheap and effective method of preserving large amounts of food dates back to the Napoleonic Wars in late 18th century France. While its origins are military in nature (regular supplies of food were scarce in winter), and demand for mass-produced tinned food skyrocketed due to military demand during World War I, it is important to note that you can can cans or glass jars in the comfort of your own home. As we talk about climate change and the ways in which we can reduce CO2 emissions worldwide, I feel that the important discussions about carbon treaties and international mandates need to be accompanied by concrete ideas as to how everyday people will be able to live healthy lives in a world where fossil-fuel intensive practices and products will come at a much higher price than we are currently accustomed to. 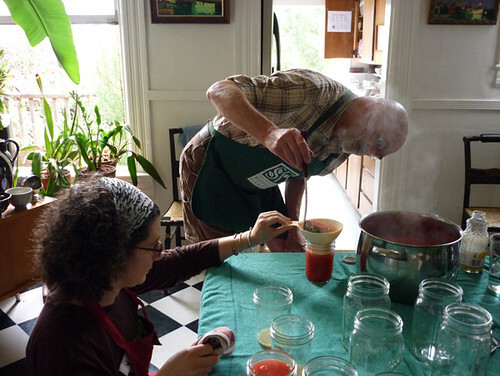 Preserving our locally grown and harvested food at home is not only a great way to eat delicious food year-round and have fun with friends, but it significantly reduces the carbon footprint associated with mass-produced and globally transported food. 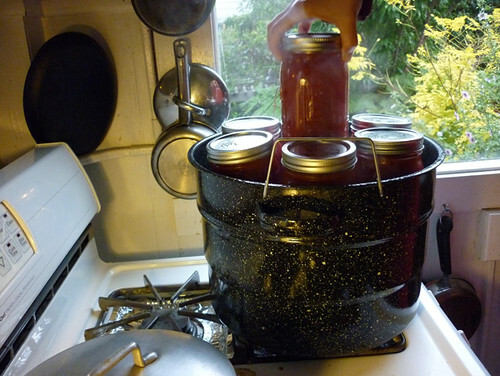 Deb had taken a workshop a few weeks earlier, where she had learned some of the basics of a successful canning session. 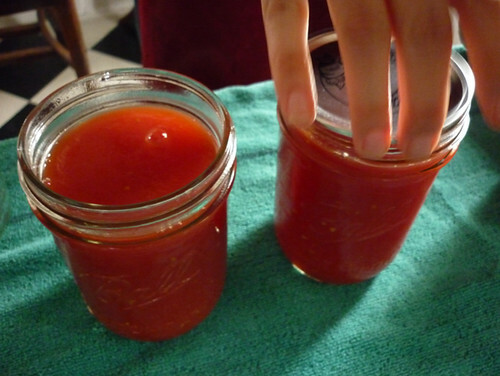 There are different techniques for different fruits, but tomatoes are some of the easiest things to can because their high acidity keeps any unwanted microbes out of your jar. Basically, you want to make sure your jars are sterilized and the seals are tight. We got 3 boxes (60 pounds) of San Marzanos, which have the best flavor for traditional Italian sauce. First, we boiled the Ball jars we had bought at the local hardware store. We tried our first batch by using a food mill, but gave up on that idea quickly. The best way to get the skins off is to blanche those puppies. Meanwhile, the jars had been properly sterilized and were now ready for some extra acid in the form of concentrated lemon juice and a bit of salt. Then the pros got to work, pouring our precious red gold into the jars. With tactile finesse, our heroes put the lids and rings on the filled jars, making sure no tomato goo would come between them. 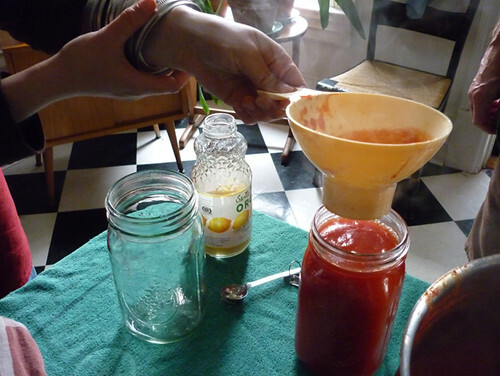 Then the master stroke: Putting the full jars in boiling water to firmly seal our winter provisions. After the lids were tightly sealed (you can see it by the dent they make), our luscious little babies got to cool off in the living room. This was one of the most fun afternoons I’ve had in a while. In between cutting, boiling and peeling we were munching on fresh heirlooms on toast, in total awe of their divine flavor. 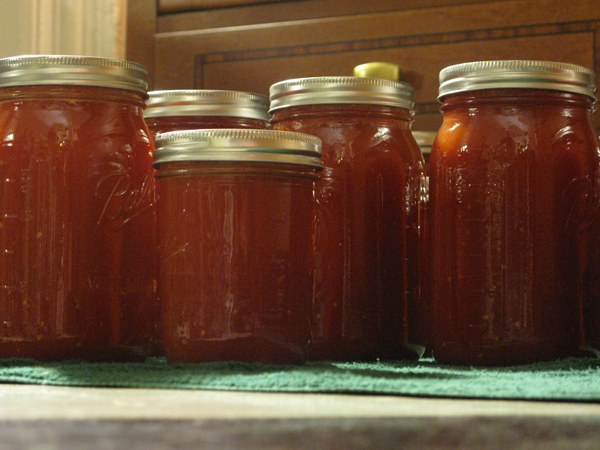 Considering that this was our first time canning, it actually went very smoothly. 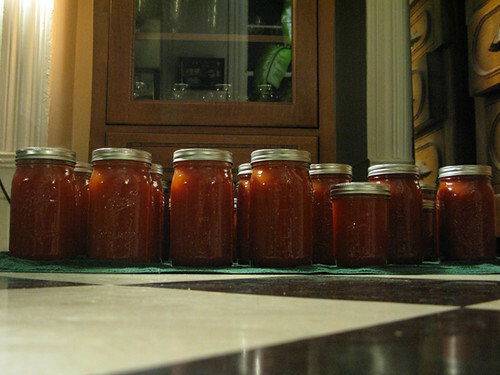 All in all, our 60 pounds (3 boxes) of San Marzanos yielded 25 quarts of delicious sauce. Of course, Ray and Alan did not wait till winter to try their first batch, and the gushing message left on our voice mail the next night was a testament to the success of our mission. Not only did we manage to make the most divine spaghetti sauce ever, but these tomatoes reminded me that despite humanity’s best efforts to remove ourselves from the rhythms of nature, it is these very rhythms that give our lives meaning, teaching us about the impermanence of all things and the wonders inherent in each moment. And that, my friends, is an important lesson to remember as we try to restore balance to our much-maligned planet. Cool! 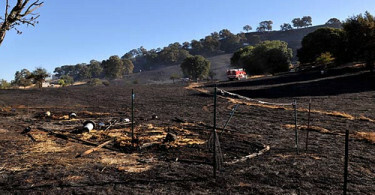 This is almost completely different from how we can tomatos in Ukraine!!! I should try it! Really? How do you do it in the Ukraine? As we’re just beginners, any tips are welcome. We usually use tomatoes in one piece with their skin and thalamuses. Put tomatoes in the jar with the following: bell pepper, laurel lea, some pepper corn (or bayberry, I’m not sure which expression is correct), other spices, some salt, sugar and vinegar. Cover jars with caps but do not seal. 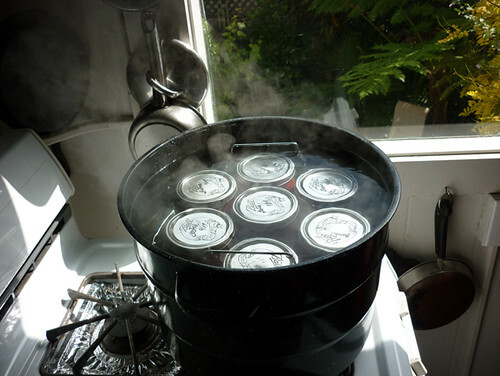 Put the jar for sterilizing into a bowl with water. 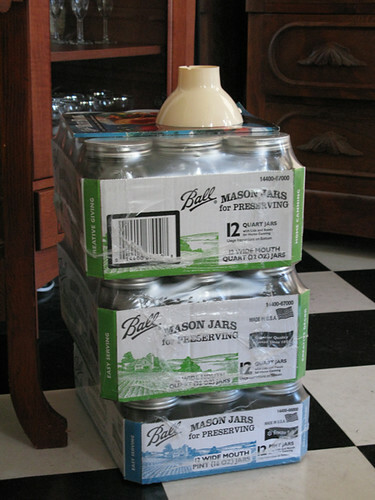 Jars mustn’t floating. Sterilize for 15 minutes. 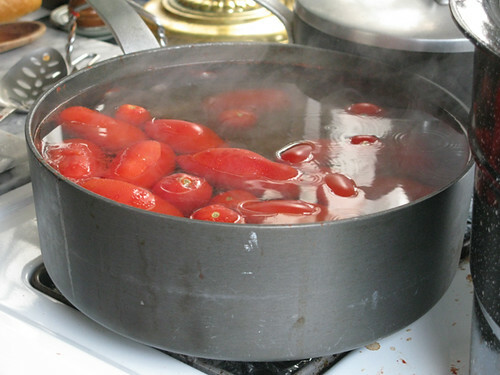 At the same time clean water should be boiled near your jars. 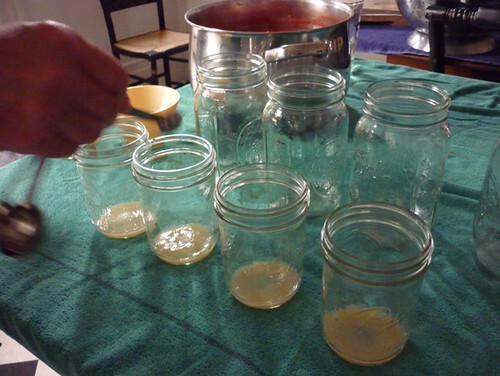 As soon as 15 minutes were finished, put out the jars and fill them with boiling water. Now they must be sealed, turned upside down and put in a warm place. This is just an example. Every family has it’s own traditions. Some put there: fennel, leafs of grapevine, etc. And in case we can smashed tomatoes, we mill tomatoes in one piece again, add some vegetable oil, spices, etc. We never boil tomatoes themeselves. Thanks for the great tips, Nadezhda. So you put the tomatoes and spices in the jar AFTER sterilizing it in boiling water, right? And then you put the full jars with the lids on back in boiling water to seal them tightly? That’s how we did it, and it seemed to work great. PS: Yum, cucumbers, we’ll have to try that! I can remember my Cherokee grandmother in her steaming hot kitchen, by herself, canning vegetables from their garden, which she also maintained alone. (I was too young then to help, I guess.) I am still in awe when I think of her and what she did to put food on the table. 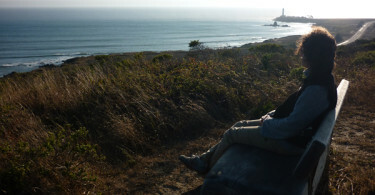 I wish I’d still been able to go there after my dad left us, but it was not meant to be. Thanks for the lesson and the memory ignited. Pam, sounds like there’s an interesting story to explore for you, with grandma’s canning as a vehicle, no? how do you go from the skin removal part to the saucy part? 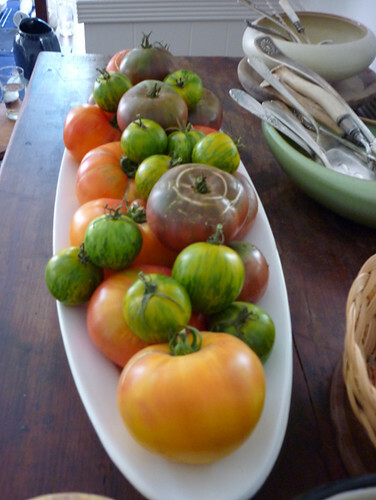 I presume you smush up the tomatoes, e.g. with a potato masher?